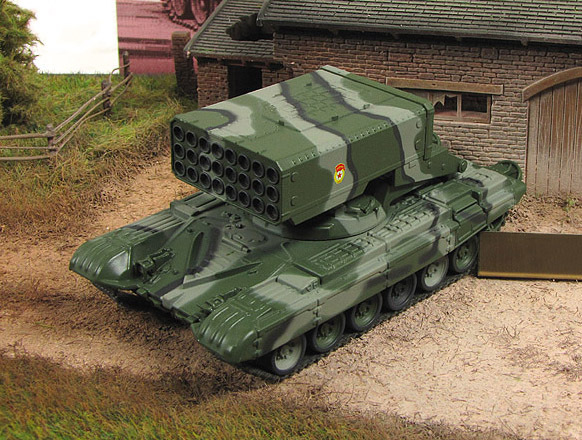 TOS-1 (Russian: ТОС-1 - тяжёлая огнемётная система, English: Heavy Flamethrower System) is a Soviet 220mm 30-barrel (original system, Ob.634 or TOS-1M) or 24-barrel (Ob.634B or TOS-1A) mounted on a T-72 tank chassis. TOS-1 was designed for defeating enemy personnel in fortifications, in open country, and in lightly armoured vehicles and transport. First combat tests took place in 1988-1989 in the Panjshir Valley during the Soviet war in Afghanistan. The TOS-1 was shown for the first time in public in 1999 in Omsk. 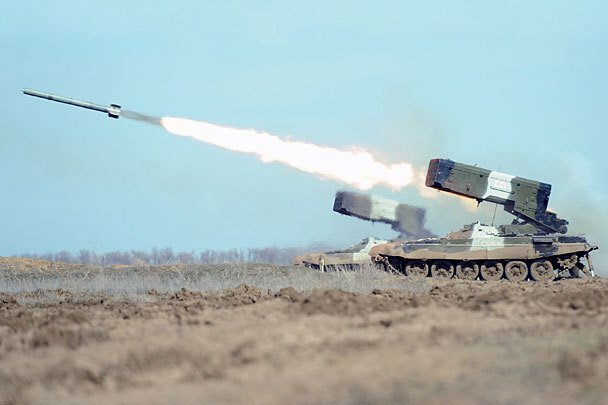 The TOS-1 is not used by the artillery units of the Russian Armed Forces but is found in NBC defense units (Russian: войскa радиационной, химической и биологической защиты (РХБЗ)). MLRS to launch rockets equipped with incendiary and thermobaric warheads arose in the late 1970s. The combat system consisting of the combat vehicle, rockets, and loading vehicle was developed in early 1980s at KBTM in Omsk and was named TOS-1, remaining a secret development for a long time. 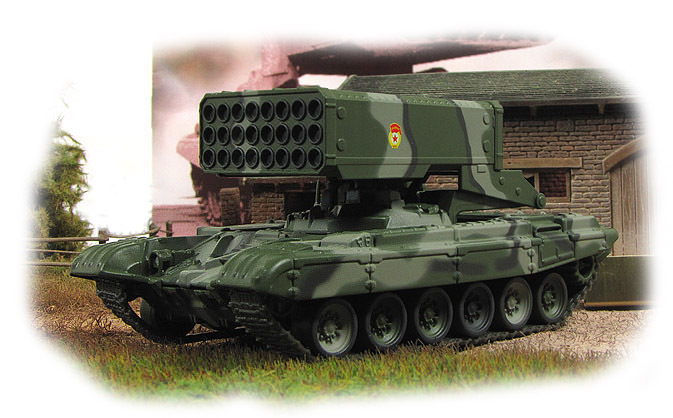 The TOS-1 is intended to engage military personnel, equipment, and buildings, including fortified constructions. The combat vehicle acts within the combat order of infantry and tanks. The large mass of the launcher and the need for a high-level of protection (due to the relatively short range of 3,500 m (11,500 ft)) helped determine the use of the chassis of the T-72 main battle tank. The reloading vehicle TZM was built on the chassis of a cross-country truck KrAZ-255B and equipped with a crane for loading/unloading of the launcher. 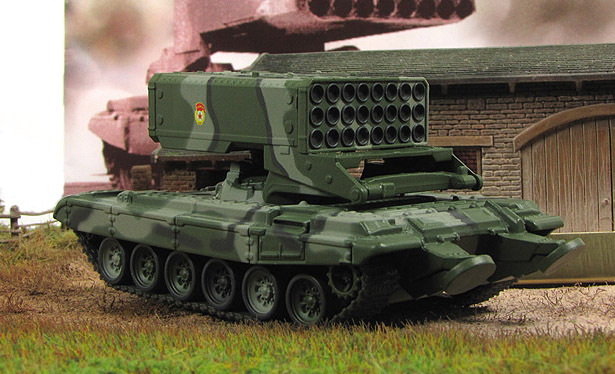 In 2001, the improved TOS-1A system entered service. The improved system's range has been extended to 6 kilometers and its ballistic computer has been upgraded. The nickname Buratino matches the name of the hero of a Russian version of a Pinocchio-style tale (by Alexey Tolstoy), because of the big "nose" of the launcher. TOS-1s were first used in combat in the Panjshir valley by the Soviet Union. Later, they were prominently used in the Battle of Grozny in 1999 by the Russian Army. TOS-1As were first used in combat in Iraq in the recapture of Jurf Al Sakhar on October 24, 2014 from ISIL forces. - The "combat vehicle" BM-1 (rus. Боевая машина) (Ob.634B) based on a modified T-72A chassis and fitted with a rotating launch system for 24 unguided thermobaric rockets. All rockets can be launched within 6 to 12 seconds. The launch vehicle is equipped with a fire control system with ballistic computer, aiming sight and laser range finder 1D14. The other standard equipment consists of a TKN-3A sight for the commander, a navigation system GPK-59, radio station R-163-50U, intercom R-174 and smoke grenade launcher type 902G with 4 barrels. The 3-man crew is armed with one AKS-74, one RPKS-74, three RPG-26s, and 10 F-1 hand grenades. The BM-1 is fitted with the same equipment as the T-72 tank (NBC protection, fire-fighting, observation etc.). 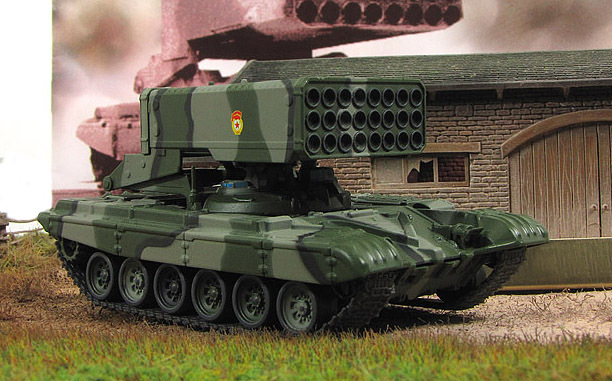 - Two re-supply vehicles TZM-T (rus. Транспортно-заряжающая машина) (Ob.563), fitted with a 10 kN crane. Each vehicle carries 2x12 spare rockets and 400 litres of fuel for the BM-1 and has a combat weigh of 39 t (86,000 lb). The TZM-T has a crew of three, armed with two AKS-74s, one RPKS-74, five RPG-26s, and 10 F-1 hand grenades. - A set of rockets NURS (rus. Неуправляемый реактивный снаряд) MO.1.01.04 and MO.1.01.04M. These are 3.3 m (10 ft 10 in) and 3.7 m (12 ft 2 in) m long and weigh 173 kg (381 lb) and 217 kg (478 lb) respectively. The original rocket for the TOS-1A had a range of only 2,700 m (8,900 ft), but the improved version extends the range to 6,000 m (20,000 ft).